The Peace Education Fund, established by President Lloyd Axworthy in honour of his parents, is dedicated to the support of refugees and war-affected persons. The award can be used for enrolment in any University course or program. The deadline for 2018-2019 is October 19, 2018 at 4:00 PM. This fund supports students enrolled in a Global College program (either the Human Rights BA or the MA in Peace and Conflict Studies), based on financial need. The amount of the bursary varies from year to year. The Fall/Winter 2018 deadline for applications is October 15th 2018, at 4:00 PM. 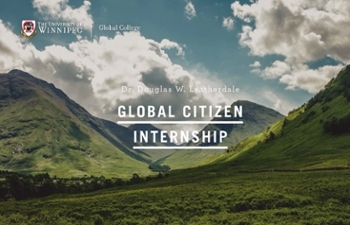 Internships are designed to support students who wish to augment their degree programs with credits obtained through international study or practica in any of the areas represented by the Institutes of the Global College. Internships are available to University of Winnipeg students wishing to go abroad and to international students wishing to pursue their studies at The University of Winnipeg. Deadlines are Friday, October 26, 2018, and Friday, March 1, 2019. What Can I Do With a PACS Degree?